Rapid Hydrocodone Detox under sedation is a medical detoxification treatment offered by All Opiates Detox for patients dependent on hydrocodone-containing opiates (Vicodin, Norco, Lorcet, and Lortab). It consists of sedating the patient and removing hydrocodone from the brain receptor while the patient is sleeping. Acute withdrawals are precipitated with an opiate blocker. These withdrawals will pass during the sedation period. Once the withdrawals are over, and the brain receptors are free of the opiate hydrocodone, a blocker is placed to prevent any opiates from getting back into the brain receptor. Hydrocodone is more commonly used to treat moderate to severe pain, although it is also available as an antitussive to treat a cough. 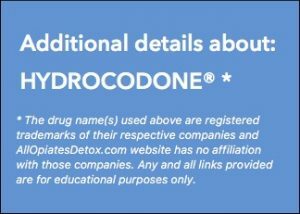 Hydrocodone is taken orally and is available in combination with acetaminophen, sold under trade names Vicodin, Lortab, Lorcet, and Norco. Hydrocodone is also combined with Ibuprofen (tradename Vicoprofen), and Aspirin (tradename Lortab); The analgesic action of hydrocodone begins in about 10–30 minutes and lasts about 4–8 hours. Hydrocodone has abusive properties similar to Morphine. Norco, Vicodin, Lortab, Lorcet, Vicoprofen, and all hydrocodone combination products were changed from Schedule III to Schedule II to infiltrate prescription drug abuse. Physical symptoms of hydrocodone withdrawals include chills and goosebumps, cramps, diarrhea, insomnia, muscle aches, restlessness, runny nose, sweating, and vomiting. Hydrocodone overdose symptoms include cold, clammy, or blue skin; excessive sleep; narrowed or widened pupils; seizures; slow, shallow, or stopped breathing; slowed or stopped heartbeat; loss of consciousness; or death. The hydrocodone combination with acetaminophen (Brand names Lorcet, Norco, and Vicodin) may lead to liver failure and death due to acetaminophen (Tylenol) toxicity. The makers of Tylenol lowered the maximum adult daily dose from 4,000mg to 3,000mg. Liver toxicity is common since Tylenol (acetaminophen) is found in combination with other drug ingredients and many consumers aren’t aware that they are taking more Tylenol than prescribed. Improper use and abuse of hydrocodone can lead to dependence, tolerance, and addiction. Hydrocodone, and hydrocodone containing products can be habit-forming, causing not only physical but also psychological dependence. Withdrawals may occur if the dose of the opiates is reduced or discontinued after long-term use. Once the patient develops a tolerance, it becomes even more difficult to stop using due to the withdrawals. Symptoms of withdrawals are an indication of physical dependence and addiction to the opiate Hydrocodone. Most patients describe withdrawals as the worst, most frightening experience one will ever encounter. One can only imagine the excruciating pain when the opiate user says that they’d rather die than go through the withdrawals. Hydrocodone physical dependence symptoms, such as withdrawals, lead to psychological dependence. That is when addiction takes over the mind and life of the hydrocodone opiate user.